to help raise awareness of, and to promote, foreign language education throughout the province through engaging in professional development conferences, workshops, activities, and events. The committee welcomes questions, suggestions and new members! In the BCATML, our organization exists to promote the advancement of modern language teaching throughout British Columbia by creating opportunities for professional development and by facilitating the sharing of information and the exchange of ideas among modern language educators. 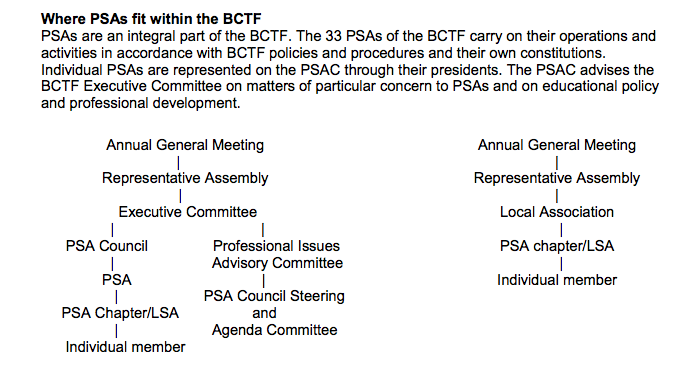 For years, BC Modern Language Teachers have maintained a strong provincial association. Twenty-five years ago, we worked with students who had limited options in terms of foreign-language courses, but times have changed: in today’s more global classrooms, we welcome students wishing to learn Punjabi, Japanese, Italian, Spanish, Mandarin, German, French and other languages. They may wish to connect with their ancestral history, communicate with a family member, travel in safety, increase job prospects, learn better communication skills, or build on an existing knowledge base. BCATML supports the presence of modern language courses in British Columbia schools, a position that supports equitable access to learning by all students and the opportunity for students to pursue their goals in sciences AND arts. We believe that by working together and sharing expertise we can give all modern language teachers and students the best opportunities for success. As a fellow PSA, LATA BC (Learning Assistance Teachers' Association of BC), describes, "Canadians are an increasingly diverse population and, not surprisingly, student diversity is increasing in our classrooms. Picture a “typical” class in any BC school. You can expect that 10% of students have low or high incidence special needs Ministry designations (i.e., autism, chronic health, mental illness, learning disability, intellectual disability, gifted, etc.). Expect to find 20% of students in the “grey area". These students do not have a Ministry tag but are not yet meeting expectations in school. On average, 40% of students are not fully meeting learning outcomes. ESL students can be expected to make up 10% of the class. The remaining 20% of students are fully meeting or exceeding expectations. Therefore, 80% of students in our inclusive classroom have learning differences that affect success in school." Add that to a language classroom requiring active student participation, dedication, listening and home practice, and wow - we face some challenges! Our hope is that the BCATML will continue to grow as a central resource for methods that will engage your students, facilitate their learning, and succeed in helping them work towards mastery in their target language. What is Local Specialist Association? An LSA is a local chapter of a Provincial Specialist Association (such as the BCATML). Why get involved in an LSA? How often does an LSA meet? Meeting schedules are up to the members. You should meet regularly, but not necessarily frequently. It is better to have a few meaningful meetings than many poor ones. It’s up to you! Some LSAs choose a topic or theme for the semester or year, others let an area of interest emerge organically. You can bring in a guest speaker, read and discuss a professional text,share lesson ideas… whatever meets your group’s needs – the possibilities are endless. BCATML would like to support our LSAs in the spirit of collaboration. New LSAs may apply for a grant to subsidize speaker or meeting costs; an application can be downloaded from bcatml.org (<Under Construction). We will also maintain lines of communication with LSA representatives to share resources and help guide inquiry, as needed. What are the expectations of an LSA? As a local specialist association you will be expected to share an artifact of your learning journey with the rest of the BCATML membership. We hope this provides you with a bit of structure to make your time more meaningful as well as an opportunity to contribute to our provincial learning community. What does working with an LSA look like? The following three models have been created to provide a framework to help get you started. A more casual group of teachers discussing issues and sharing resources in their practice. A group exploring a shared passion in their practice. A group committed to inquiry. The goal of this model is to effect positive and tangible shift in your practice. Are there any common interests? Meet as needed to share with and support each other through your journey. Report out at year end: Write something for the BCATML blog or our newsletter. Share a digital artifact, or a series of artifacts from your meetings and journeys.We want to hear all about your experiences and share your learning with the rest of the BCATML membership! Thanks to our fellow BCTF PSA BCTELA (BC Teachers of English Language Arts) for this great information about LSA's!